Hullo. 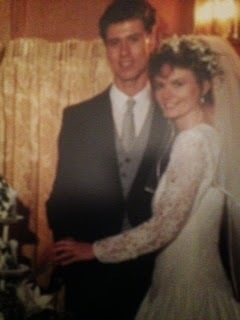 Just a short note to say today is my 24th wedding anniversary! 24 years! and they said it wouldn’t last. No, they did actually say it wouldn’t last. HOH had a somewhat undeserved reputation as the church lothario before we married and I was warned off several times by well meaning friends. (Well my Mum’s friends actually) If I were feeling that way inclined, I would write a very spiritual post about not judging on other people’s opinions but I’m not. So just going to content myself by wondering if my tummy was ever that flat and then off to work. As you do. The dress is in a bag somwhere. It went walkabout when we moved. Think I might be a bit depressed if I tried to get into it. How pretty you look! Congratulations on your Anniversary, sorry you have to go to work! Beautiful dress on a beautiful bride! Happy anniversary! I'm happy to read that you (and he) proved the naysayers wrong!